High surf created dangerous conditions at San Diego-area beaches on Friday and damaged the Ocean Beach Pier. Part of the pier’s railing broke away, and could be seen swaying when hit by large, oncoming waves. 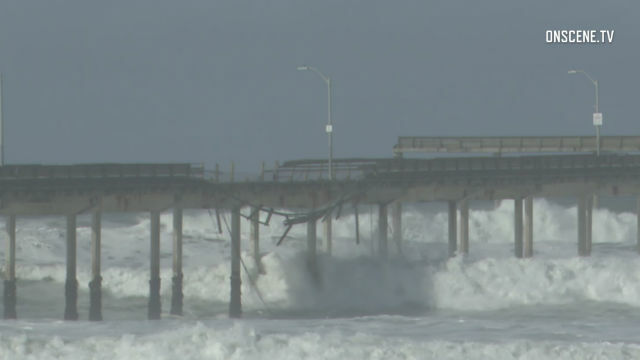 “Powerful surf has caused significant damage to the Ocean Beach Pier, which remains closed today,” the City of San Diego announced. The pier is expected to be closed for several weeks while repairs are made. Seawalls in La Jolla and Mission Beach were breached, and portions of Newport Avenue and Abbott Street in Ocean Beach were flooded. A west-northwest swell from 280 degrees caused high seas in coastal waters and surf of 6 to 11 feet at beaches, with sets up to 14 feet south of Encinitas, according to the National Weather Service office in San Diego. The weather service issued a small craft advisory and warned that navigation through entrances to harbors and bays, especially Mission Bay, would be difficult. Seas and surf are expected to gradually diminish Saturday morning.